The Cathedral is located over a mile from the nearest metro station, but when I rounded a corner I instantly knew it was worth the walk. The massive silhouette of the Cathedral was outlined against a blue sky. It’s one of D.C. tallest buildings and it shows. It towers over everything – it reminded me of a shepherd looking out over his sheep. The tour guide was an architectural professor. She was able to explain things in simple terms, which is great for a novice like me. Among other things, she explained that the Cathedral was built entirely out of private donations, which is why it took 83 years to finish it. The construction had started in 1907, in the presence of President Theodore Roosevelt. It was finished only 25 years ago, in the presence of President George W. Bush. To casual spectators it doesn’t really show that the Cathedral is so young. Architects have used various Gothic architectural styles of the Middle Ages, identifiable in its pointed arches, flying buttresses, and stained-glass windows. It therefore resembles many European cathedrals. 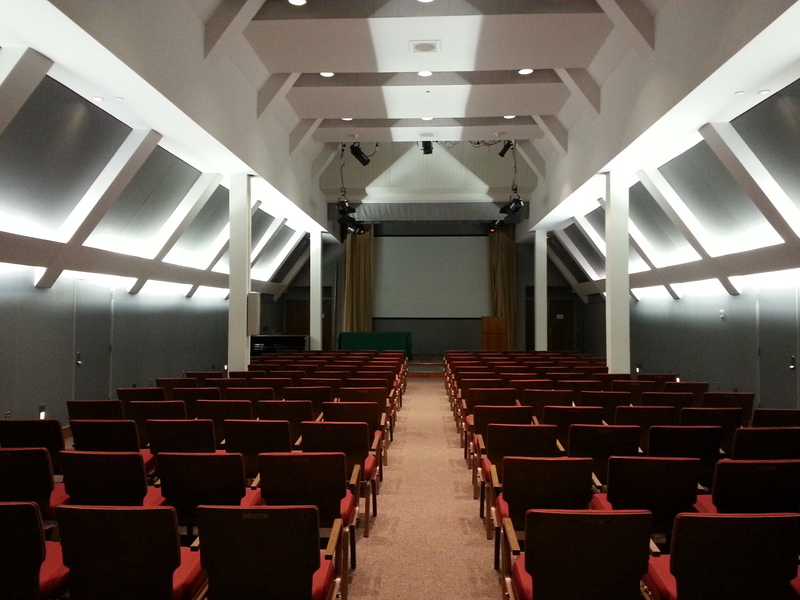 This modern auditorium was placed right above the curved inner ceiling of the Cathedral. How different from the dusty attics in Europe! In other ways, though, it clearly was very young. The symbolism is easier and modern, and the dominant language is English rather than Latin. My mum and dad started a slating business decades ago, so I spent some summers atop dusty churches and cathedrals. It was always a pain to find power outlets, and we had to be extremely careful where to walk, as many of the roofs and their wooden support structures were centuries old. How different things were here – there were nice, even, well lit walkways crisscrossing the upper and lower levels, well signed and with abundant safety warnings, and with numerous power outlets. Today, we are ‘authorized personnel’! Every year during the construction of the Cathedral, the working crew would drink a bottle of champagne during New Year’s Eve. All workers that were present would sign the bottle. The miniature of the Cathedral that literally travelled the country, as it was used to collect funds for the construction. How strange – a lead roof! A good view of D.C. Can you see the Washington Monument and the Jefferson Memorial? Yep, it looked pretty ‘modern’ behind the scenes. Oh yeah, there we go again! One of the beautiful windows, all depicting biblical stories. A last view of the Cathedral, before we went down again. Even though everything is organised strictly secular – no funds from the government to the Cathedral – it is also an important place for nationalism and American patriotism. 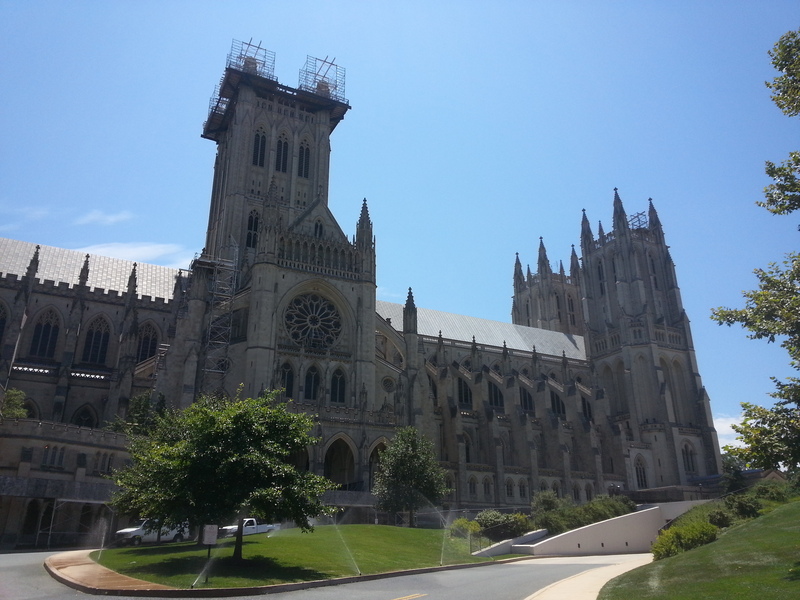 There is a reason it is called the National Cathedral. Two of the massive stained-glass windows, for instance, honour the American governmental system and the separation of powers. One shows the White House, with biblical stories that supposedly characterise the function it has. The other does the same, but for the Capitol Building. Yet another stained-glass window tells the story of the first moon landing. You can find commemorations for people or events that had a big impact on the American society in many more places in the Cathedral. A rock retrieved from the Pentagon crash site reminds people of the tragedy of the 9/11 attacks. Red needlepoint kneelers at the St. John’s chapel recognise hundreds of Americans for their individual accomplishments. Several former U.S. Presidents, including George Washington, Woodrow Wilson, and Abraham Lincoln, are commemorated in dedicated memorial bays. The tour guide told us that the Cathedral serves as place for peoples of all faiths and denominations to pray and celebrate the great nation of the U.S. Yes, a proud people alright. The stained-glass window about the moon landing, with an actual moon rock in it! The guide explained that even though the construction of the building was finished only 25 years ago, the Cathedral will, sadly, be adorned by scaffolding for years to come. An earthquake hit it in August 2011. The building sustained $26 million in damage, including broken and twisted pinnacles, cracked stones and mortar. She explained, moreover, that the Cathedral is a solid masonry structure. The limestone blocks are laid one on top of the other, with mortar between them. It was probably because of the more modern steel structure of the roof that the damage wasn’t even more catastrophic. After the Behind the Scenes Tour finished, I decided to take the normal, ‘In Front of the Scenes’, tour as well. This one is free and takes you past the most important sights inside the Cathedral. Do not forget to visit the basement as well. It houses three additional beautiful chapels and a center for prayer and pilgrimage. One of the officials of the Cathedral remarked, “Hey – still here?”, as he had seen me take the other tour more than two hours ago. Having spent a good three hours inside, I walked out into the humid, hot summer day again. I sauntered around the Cathedral, and spotted the Bishop’s Garden. It is modeled on a medieval walled garden, and features herb and rose beds and many stone structures. I stepped down its winding stone paths and enjoyed the strong sun, before I headed back to the metro, and went home. So, all in all, I can absolutely recommend anyone to visit the Cathedral. I had not expected to find anything quite like this in the U.S. – I thought I had left those behind in Europe. The tour guides are extremely knowledgeable, which you may expect, but they also know how to tell a good story, which is rarer. The $30 is perhaps somewhat steep, but a price I would gladly pay for the case of secularism. That being said, do adapt your expectations before you visit the Cathedral. It is not the same as, say, St. Paul’s Cathedral (London), Cathédrale Notre Dame (Paris), or St. Peter’s Basilica (Rome). But it doesn’t have to be – it’s an entirely different kind of thing, not necessarily any less interesting. This entry was posted in Travels and Trips and tagged D.C., daytrip, National Cathedral, religion, travel, trips, Washington. Impressive tour. Many thanks. Don’t many think it is a Catholic cathedral, whereas it is Episcopalian?